The selection has doors with different panels and decorations. As a result of constant development, we have achieved great durability and safety standards. Protection against fingers getting slammed between the gate panels is applied during the making of the products. Isolation is provided by insulation as well. We offer a varied selection of garage and sectional gates. TLB – 4 cm thick polyurethane filled sandwich-type segments are used in the making of the segmented gates. On top of the segments are 10 cm wide bands that leave the impression of a uniform surface. These types of garage gates can be up to 6 metres wide and 3 metres tall. TLC plaque doors fit perfectly for traditional and modern style buildings. The even distribution of design elements on the segments leaves a finished impression on the doors. Garage TLC plaque doors can be manufactured up to 6 metres wide and 3 metres tall. 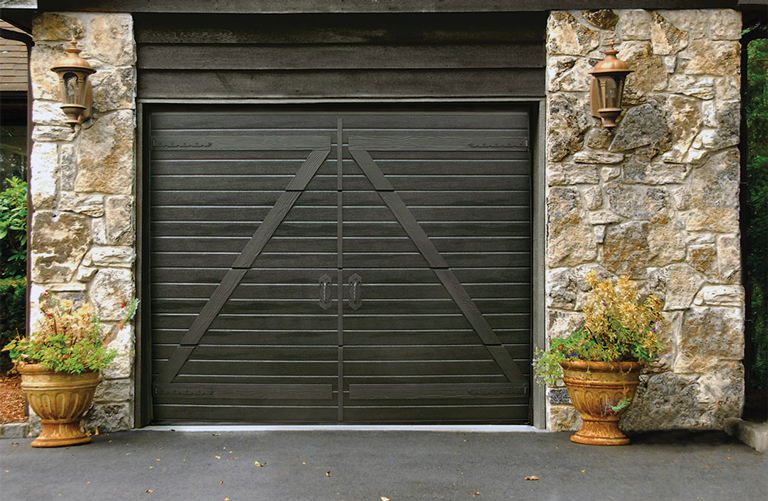 TLS – garage gates, specially designed with a smooth surface. The outer stain-coat that is 50% thicker gives the product an especially even and smooth surface. This kind of gate design fits perfectly for modern buildings with an exterior. TLS-gates can be manufactured up to 6 metres wide and 3 metres tall. TLW wood imitation gate sections are coated with a UV-resistant PVC coating. Coatings with several different colour options give the sections not only a fitting colour tone, but also protection against the environmental effects. TLW garage gates can be manufactured up to 6 metres wide and 3 metres tall.